Resident Evil 7's announcement at E3 wasn’t necessarily a surprise, but the form that the game is taking sure is. Announced during last night’s Sony E3 showcase, Resident Evil 7 is Sony VR compatible, and it is possible to play the whole game with the device. It is first person, which is a first for the series outside of the arcade shooters Resident Evil: Umbrella Chronicles and Resident Evil: Dead Aim. The initial trailer didn’t show anything in the way of zombies, or the Las Plagas parasites from Resident Evil 4 and 5. Needless to say, people are curious about the direction the series is headed in. I stayed up way too late to download and play the demo. Here are my initial thoughts. Minor spoilers for Resident Evil 7 from this point on. Comparisons to P.T. have been made, for obvious reasons. Actually playing the demo, I find the comparison between the two apt, but also incomplete. Based purely on the teaser, Resident Evil 7 reminds me more of Condemned: Criminal Origins twisted into the original Resident Evil. From a gameplay perspective, P.T. and RE7 really aren’t similar at all. Once you get over the initial shock of playing a first person Resident Evil, the game has a lot in common with it’s PlayStation 1 era predecessors. You are exploring a decrepit, abandoned area, solving light puzzles and finding key items to move deeper into the place. There is some basic inventory management in the teaser, which I fully expect to be expanded upon in the final game. There is no combat in the demo at all, and without going too far into spoiler territory, there really aren’t any enemies to avoid either. I find it hard to believe that there won’t be any combat (in fact, you can find a toggle for “aim assist” if you look through the options), but we could be looking at a throwback to the original games where combat is more situational than required. Edit: Since the writing of this post, combat has been confirmed by Capcom. The sound design and visuals are also in line with what fans expect from the series. Resident Evil has always excelled in the sound department, and even the actionized Resident Evil 4 generated some genuine scares due to it’s creepy ambiance and disturbing music. Resident Evil has always tried to elicit scares out of body horror, gore, and general grossness, and there is a good amount of that on display as well. Really, the only reason the P.T. comparison works at all is the deep mystery surrounding the little chunk of gameplay available. Players have already theorized that much like P.T., there is a “true ending” depending on solving certain puzzles or seeing things in a certain order. A more paranormal approach like the one hinted at in the teaser isn’t unprecedented in the series, but it would be the first time that it makes it to a finished game. Even though I mostly enjoyed the teaser, I have a couple concerns. 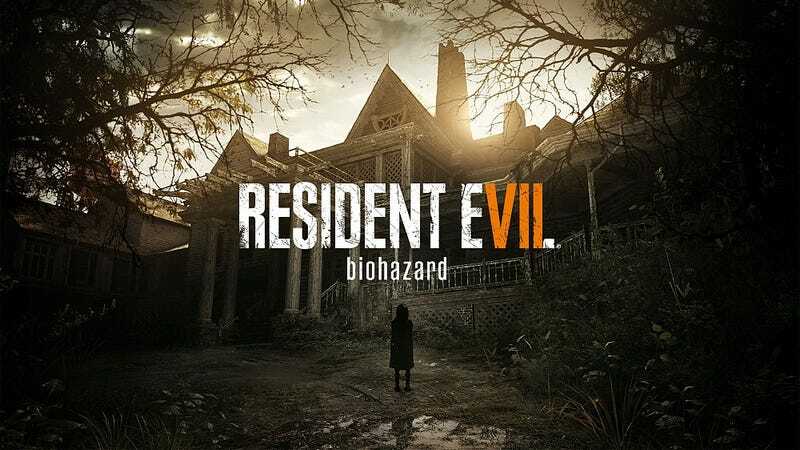 It was made clear that Resident Evil 7 could be played either with or without the use of VR, but I wonder what kind of changes or restrictions had to be made to the game to get it to work in VR. Full 3D movement in VR is still a challenge that game developers are working through. Movement isn’t an issue in the teaser, but it could simply be a build of the game created for specifically for the purpose of creating a demo. I also worry about the overuse of darkness, which is a signature of bad indie horror games that show up in Steam Greenlight. The limited visibility is effective here, but a whole game of it would grow tiresome quickly. At this point though, I choose to be cautiously optimistic. Capcom learned all of the wrong reasons from Resident Evil 4's success, and that lead into the turgid, lifeless Resident Evil 6. The game industry truly believed during the last generation that people didn’t want survival horror games, and it took the success of indies like Amnesia, Outlast, and Slenderman to show that there was a huge market being underserved. Some fans are quite concerned about the changes. The Resident Evil reddit board and pretty much any comments section about the demo or trailer are proof of that. The last time Capcom spun the series into a new direction, we got Resident Evil 4. When I am not writing about games, I sometimes stream them at twitch.tv/omegaredpanda. Also, follow me on Twitter and check out my newest venture: The Awesome Bomb Wrestling Podcast. For updates on all things TAY, follow TAY on Twitter and Facebook.